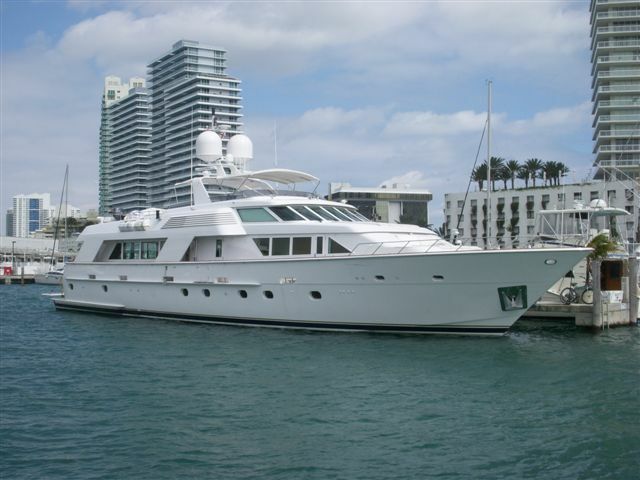 Motor yacht SCHNUPSI is a 34.42m (112' 11") yacht, custom built in 1991 by Hatteras Yachts. 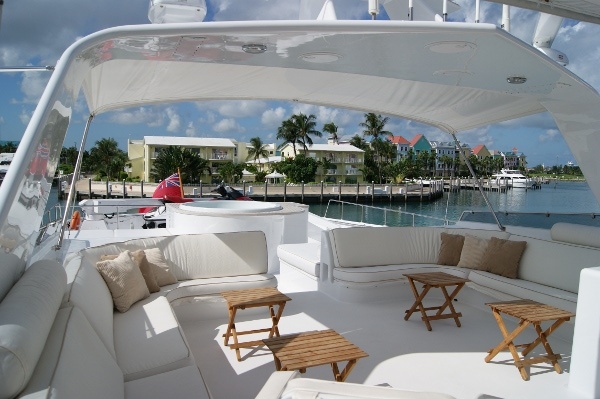 Hatteras Yachts were responsible for her exterior and interior design. 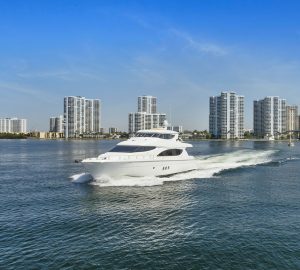 Yacht Schnupsi was commissioned by a 3 time Hatteras owner who understood the strengths of the builder and worked closely with design and production to create an elegant and comfortable yacht with versatile performance that was the flagship for Hatteras. 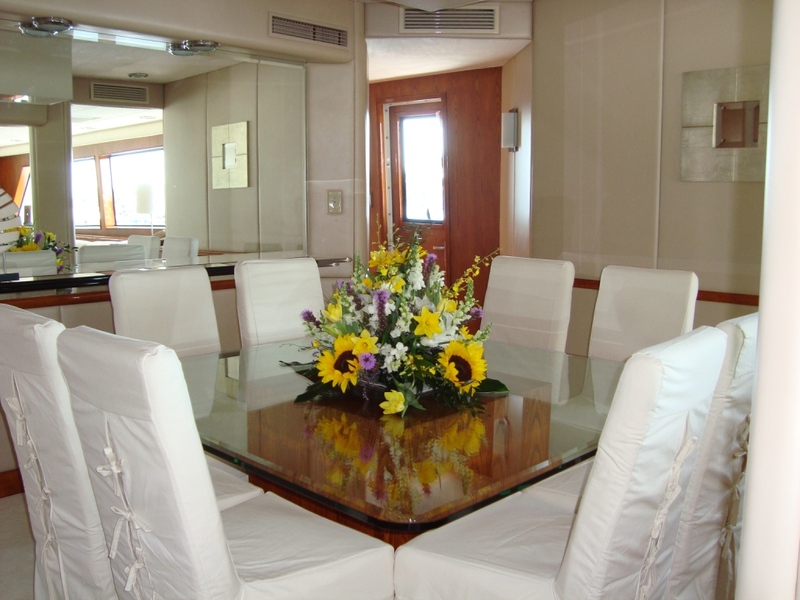 The yacht received an extensive Refit 2009 which included an extension and addition of a guest cabin on main deck. 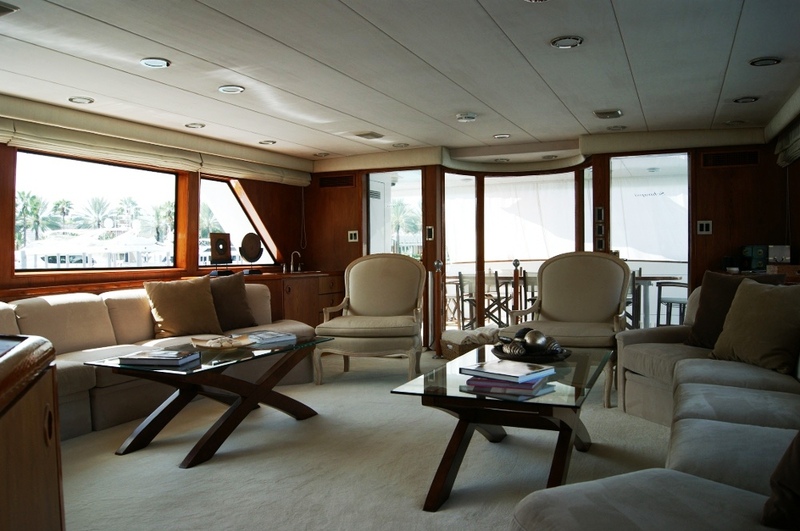 The main saloon of M/Y SCHNUPSI is contemporary, with opposing couches upholstered in earth tones with matching coffee table. Window, door frames and hardwood trim is finished with a warm cherry stain. The yachts window sill is low lying with large windows creating a spacious and bright space. Forward of the main saloon is a semi-enclosed dining area, separated from the saloon by modern columns, which are on either side of an aft-facing entertainment center. 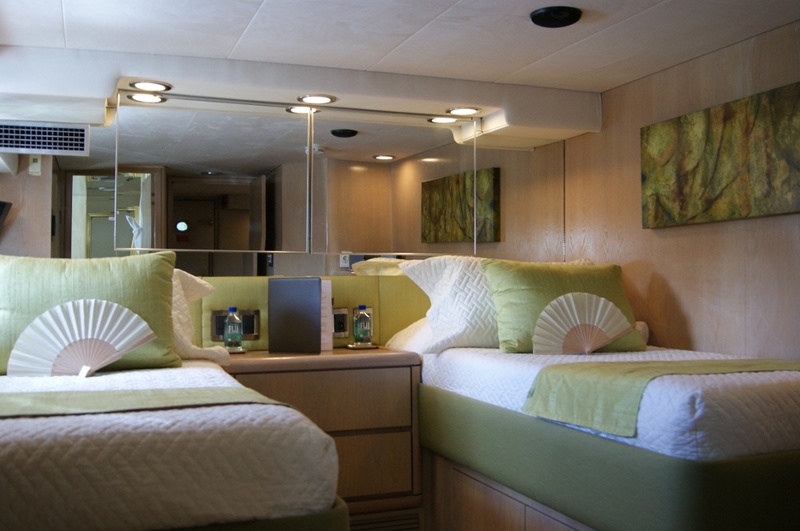 A starboard passageway leads to a day head, and further forward is the stairway leading to the flybridge, beyond which is a comfortable on-deck stateroom with centerline queen berth, plasma TV, storage and an ensuite with separate shower, finished with modern fixtures. 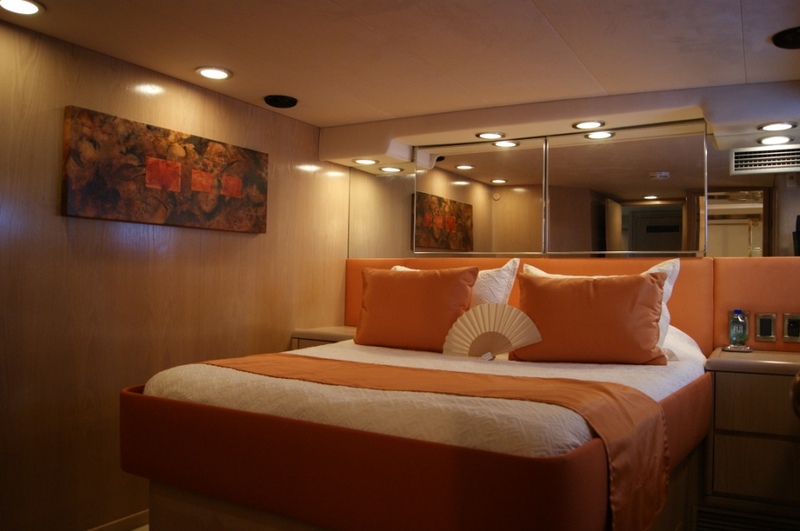 This stateroom is bright, intimate and suitable for a compact wheelchair. 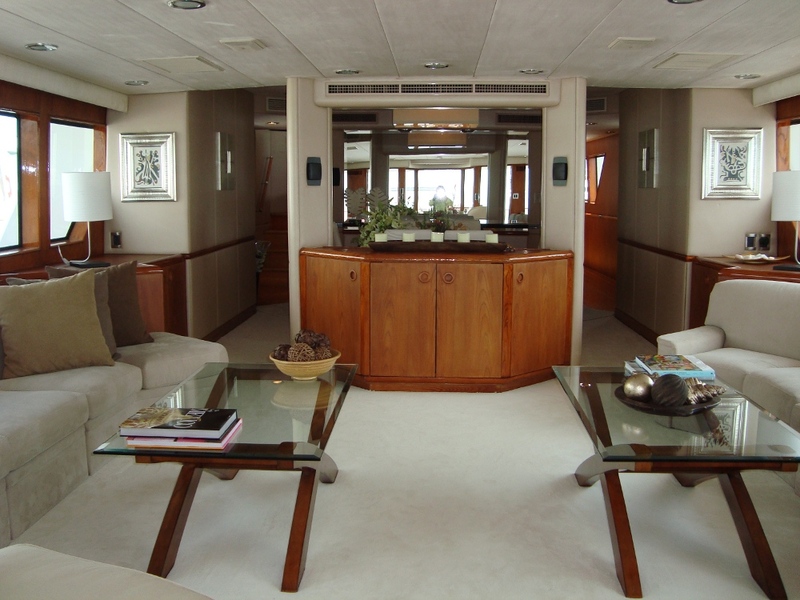 Aft on the main deck is an open seating area that is well shaded and is the perfect for 10 guests to enjoy alfresco dining on the varnished teak dining table with gold inlay. Decks are teak, clear wings doors open to each sidedeck. A centerline bulwark door provides shore and swim-platform access. The entrance to the main saloon is via port or starboard “invisible” doors. Between the two doors is a unique circular stairway, which leads down to the aft, guest accommodations. On the lower deck of motor yacht SCHNUPSI, the aft circular stairway opens into a pleasant library / foyer with a small couch, shelving and lights suitable for reading. There is a twin cabin located to starboard aft and a queen stateroom to starboard. 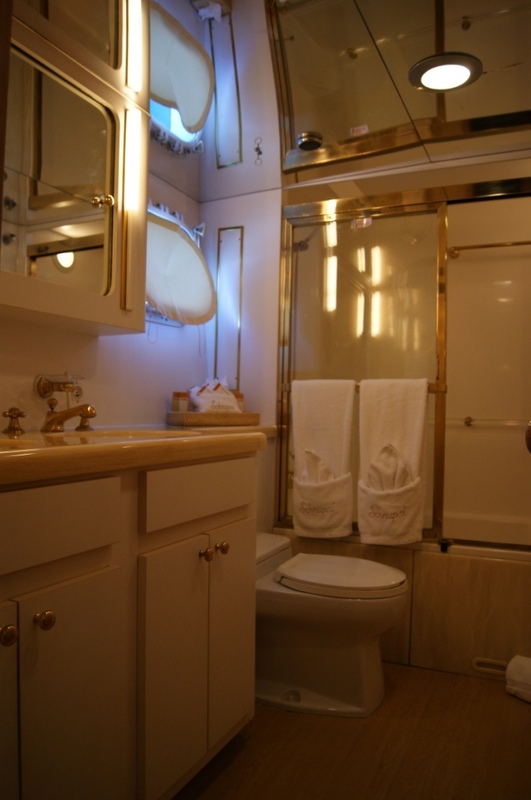 Each stateroom includes full sized closets and bureaus, private bath with double sinks and shower compartments, private media components and individual climate controls. 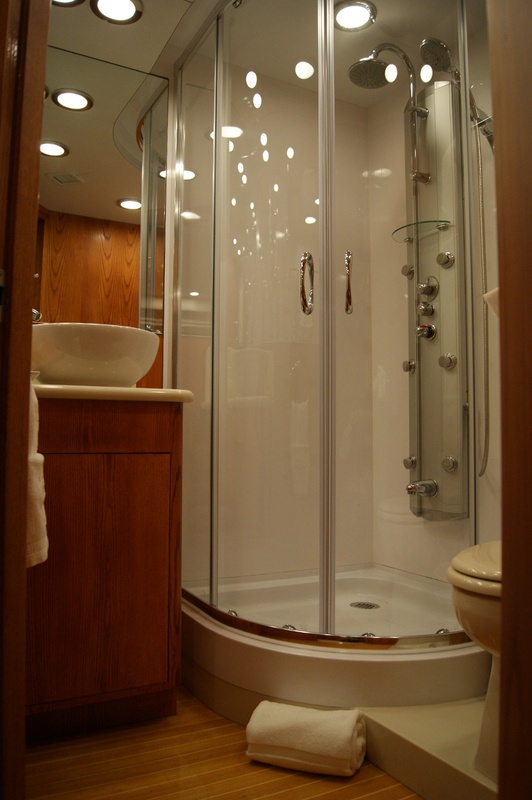 Forward of the engine room is the full beam owner’s cabin with a private stairway. 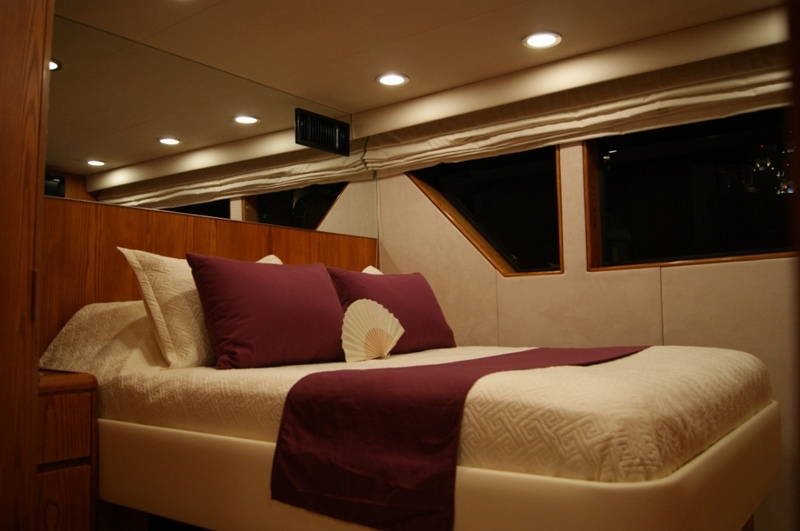 The large cabin spans the yachts 24’ beam and is graciously furnished with a typical abundance of drawers, a large walk-in cedar closet, vanity area and a large bathroom with double sinks, bathtub, bidet and high-grade fixtures and appointments. The flybridge on yacht SCHNUPSI was totally reconfigured and optimized during the refit, with a Spa Pool, larger tender space and more intimate seating. The grille, icemaker and sink were also replaced and updated. There is shaded seating for up to 12 guests. Further aft, two king sized sun pads lay on either side of the spa pool. 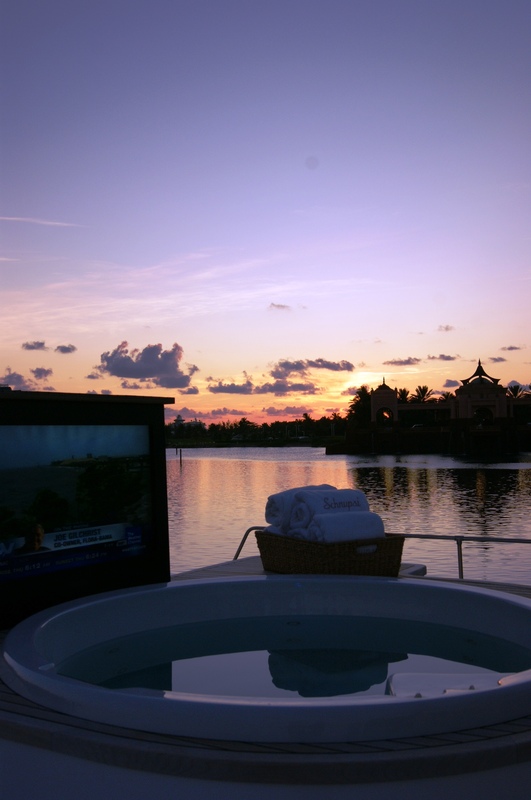 Aft of the tub is a 40” waterproof retractable TV screen with a full menu of media choices. 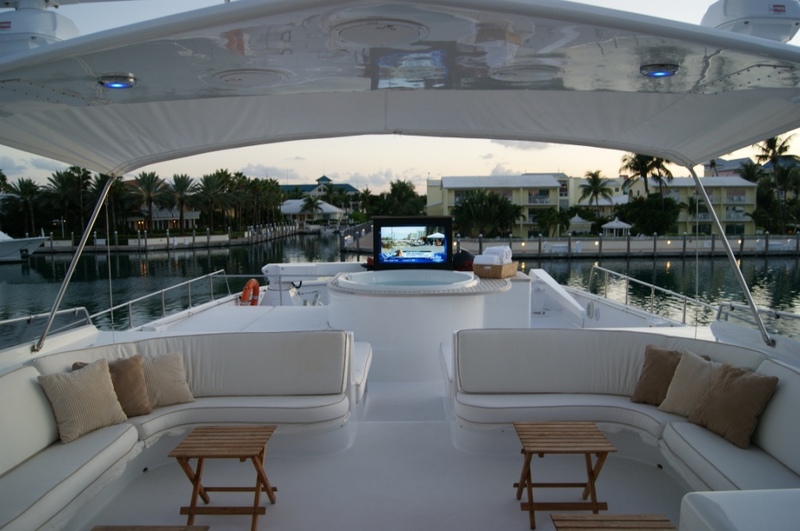 Forward on the flybridge is a helm station with seating for two that is sheltered by an angled wind-screen. The sloping foredeck also offers two additional sunbathing spaces, fitted with comfortable, terrycloth cushions. 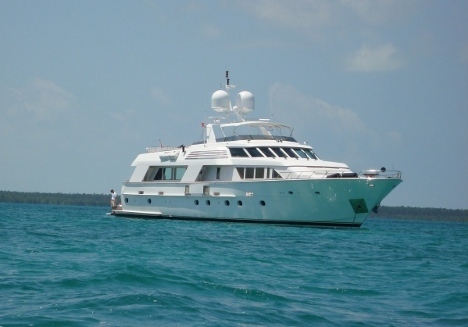 Hatteras motor yacht SCHNUPSI is able to sleep up to 8 guests overnight in a Master cabin located on the lower deck amidships, a twin and a double guest cabins located aft and a Double Guest cabin on the main deck. 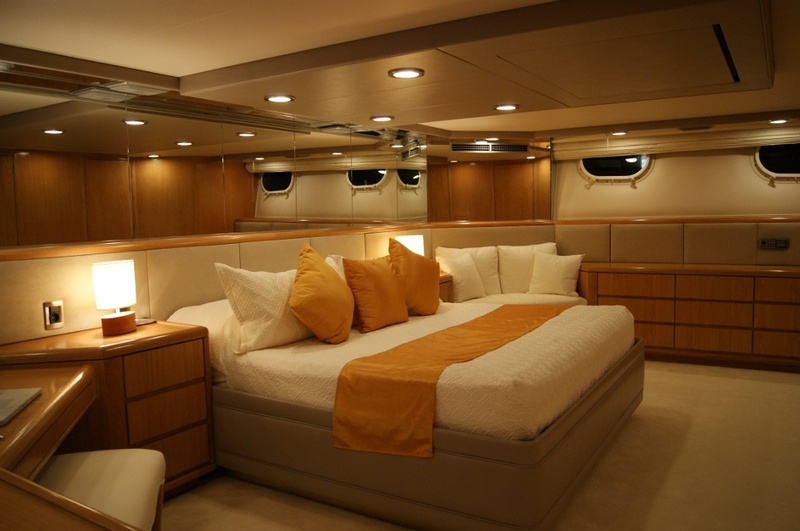 Please contact CharterWorld for a full list of extras and amenities offered onboard SCHNUPSI yacht.